June 1 | A showcase of religious heritage of the Surigaonons in honor of St. Virgen de la Paz Y de Buen Viaje. A showcase of religious heritage of the Surigaonons in honor of St. Virgen de la Paz Y de Buen Viaje. A showcase of religious heritage of the Surigaonons in honor of St. Virgen de la Paz Y de Buen Viaje. June 1 | A procession at sea led by the Patron Saint of Bilang-Bilang, Virgen dela Paz Y Buen Viaje, the patroness of good voyage aboard a beautifully adorned vessel followed by colourful motor launches and bancas passing through the Surigao Strait and back to the City wharf. June 1- June 6 | Various activities in support of the Philippine Eagle Conservation Program. June 1- June 6 | A week’s celebration featuring agro-industrial fairs, sports, beauty pageants, concerts, cultural shows and street dancing. June 1- June 30 | The festival aims to create awareness and appreciation of Philippine Art and Culture; and promoting arts and culture as vital attraction for local and foreign tourist. Rizal has the potential of becoming a tourist destination particularly in the field of arts and crafts. It is known as the home of various national artists, musicians and other equally creative artist. June 1- August 31 | To promote domestic tourism, the Provincial Government is sponsoring guided tours to elementary and secondary students. The tour includes visits to important kind marks and scenic spots. June 8- June 12 | The toughest four-day adventure race and the biggest in the Philippines. It involves trekking and trail running, kayaking, mountain biking, swimming, rappelling, orienteering, land navigation and special skills section. June 8-14 | A yearly celebration of a bountiful harvest. A time where farmers display their various cassava-based products, share their varied technical experiences in producing and processing cassava products. Among the activities are the Best Booth Contest, Poster Making contest, Search for new cassava food products, cultural night and the search for Miss Camotes Tourism. June 10 | A grand parade of “lechon” – (roasted pig) in the main town plaza decorated with various vegetables, spices, crops , and other edible items from the farm. June 10-23 | A celebration of the centennial of the founding of the civil government of Palawan. Highlights are LGU Trade and Food Fair, colorful parade with participation from the different municipalities and private sectors featuring the ethnic groups residing in the province. June 11 | A province wide celebration of Rizal’s founding anniversary. Activities are parade, street dancing, trade fair and art exhibit; search for Ms. Rizal, poster making, quiz bee, basketball exhibition game and ballroom dancing for senior citizens. June 12 | Re-enactment of the historic proclamation of the Philippine Independence is done at the mansion of Gen Emilio Aguinaldo, the first president of the Philippine Republic. June 12-15 | Highlighted are street dancing, agri-industrial fair, parade, beauty pageant, float parade and sports competitions. June 12- June 16 | General cleaning and tree planting acitivity along with cultural shows and sports fest. June 12- June 17 | Anniversary of Agusan Del Norte. It is highlighted with civic parade, sports fest, and agro-industrial fair. June 12- June 17 | A celebration of the Foundation anniversary of Agusan del Sur, a week-long socio-cultural and arts exposition of indigenous tribes in the entire Agusan valley and displaying their skills and gracefulness in dancing as part of their ritual activities. June 12-20 | Charter Anniversary of Cotabato City. June 13-18 | A one week thanksgiving festival for the bountiful harvest. June 14 | Commemoration of the historical victory of the Filipino guerillas in Northern Luzon which led to the surrender of Gen. Yamashita and the end of the Japanese occupation in the Philippines. June 14 | A historical celebration of the USAFIP NL liberation at Bacsil Ridge honoring Filipino soldiers (heroes). June 14-19 | A week-long thanksgiving celebration with different activities such as mountain biking, motorcross, and mountain climbing, and display fruits and vegetables and tribal exposure of their cultural beliefs and crafts. June 14-28 | A cultural festival showcasing cultural presentations, craftsmanship, chants, songs, and rituals. June 15- June 23 | A festival featuring the sweet, succulent pineapple thru art exhibits, trade fairs, cultural performances and sports events. June 16 | A thanksgiving celebration for the good harvest. June 17 | A thanksgiving celebration for the blessings and bountiful harvest. It is celebrated every June 17 up to the last Saturday of the month in accordance with the practices of the tribe. June 17 | A street dancing parade using nipa (palm) as the major Decorative items / and costumes. June 17-19 | Fiesta featuring Kalanguya showcase of their culture and rituals, typical baratillos, playground demonstration, product exhibit and selling, and people’s night. June 17-20 | Features the typical celebration of a town fiesta with baratillos, parade, playground demonstration and people’s night. June 17-24 | In honor of Nuestra Señora de Porta Vaga, sprinklers are installed at the City’s streets so that revelers get a shower. Regada is derived from the word regar which means water. The affair showcases what is best and unique among Caviteños. June 18 | Week-long socio-cultural activities, talent and sports competition and pageant night. Highlight is street pageant depicting the legendary and mythical story of the golden bells of the municipality. June 18-19 | Boston A celebration of Pabulig festival. June 19 | The provinces of Surigao del Norte and Surigao del Sur Simultaneously commemorate their charter anniversary. June 19 | Commemorative celebration of the birthday of Dr. Jose P. Rizal our National Hero. June 19 | Description In memory of the birthday of the Philippine National hero, Dr. Jose P. Rizal, the townfolks of Calamba offer flowers at the Rizal shrine. A civic parade is organized to feature the life and times of Dr. Rizal and culminate at the town plaza. June 19 | A massive tree planting activity to help alleviate global warming. June 19-24 | Fluvial festival to showcase the bounty of coastal resources, lectures on coastal protection/management; cultural presentation and parade. June 20 | Street dancing and colorful parade highlighting native Subanen costumes and rituals. June 20 | Re-enactment of the exchange of the images of Señor Santo Niño between the Basey barrios of Buscada and Kankabatok (now Tacloban). June 20 | Ceremonial exchange of images of the Holy Child between Leyte and Samar. June 20- June 27 (3rd week of June) | A festive reforestation dine by practically all people from different walks of life with activities such as performance of the environmental artists of Puerto Princesa through songs dances. June 20- June 29 | Pili is an indigenous crop of Bicol region, particularly Sorsogon. This festival showcases the PIli, the primary purpose of which is to emphasize its importance and to increase the awareness of the public on its various economic uses. June 20- June 29 | A merrymaking held in conjunction with the town fiesta. The festival whose name was derived from a tree which is abundant in the area features various exciting events including street presentation, beauty pageant, trade fair, among others. June 21 | A festival highlighted with street dancing in honor of their patron saint. June 21-26 | Anniversary celebration of the establishment of the civil government of Batanes highlighted by cultural activities and demonstrations commemorating how the Ivatans became sturdy survivors of history, more united, more established and closer to the world through songs, dances and rituals. June 23 | A celebration in honor of the patron saint St. John the Baptist. June 23 | Features the “Empanada Festival” showcasing and promoting the very traditional fastfood and the One-Town-One-Product (OTOP) of Batac. Activities include, mass, dance parade (dancing with the same music of Empanada where different stages of preparing and empanada were depicted), empanada making and eating contests among political leaders. June 23- June 30 | Anniversary celebration of the establishment of the civil government of Cagayan highlighted by an agro-industrial trade fair, cultural presentations, lectures, exhibits, beauty pageant among others and the novena to the miraculous image of Our Lady of Piat at the Piat Basilica Minore. June 23 - July 2 | A religious and cultural revival in commemoration of the Christianization of the Itawes region of Cagayan. Activities are colorful shows, novenas and street dancing; cultural presentations by indigenous groups. June 24 | A yearly festivities in honor of St. John the Baptist highlighted by Search for Perlas ng Kaliguan beauty pageant, beach dancing and other beach-fun activities. June 24 | Held annually in honor of St. John the Baptist with fluvial procession, parade and water sports. June 24 | A yearly celebration of Manila Day featuring various activities like the Manila Film Festival, Fireworks Display, etc. June 24 | Legend says that a long time ago, a fisherman saw the statue of St. John the Baptist which became Pola’s patron saint. Sab’uyan Festival takes place every June 24 in honor of St. John the Baptist whose image is taken from the church and carried on procession accompanied by a band and set on a beautifully decorated boat to the sea where it was first found. The Sab’uyan begins. People in the boat throw seawater to one another chanting “Viva San Juan Bautista”. After the procession at the sea, the image is carried around town. Dancers from various groups follow the image. The Sab’uyan continues. The splashing of water is received with good humor for the people believe that being doused brings good health, luck and happiness. The procession ends at the church plaza. June 24 | The idea of the festival revolve around paying tribute to the cows. But instead of showcasing the real cows in their annual parade, the local government decided to depict the cows in their dancing because based from the legend where the name of Tiaong came from the mowing of the cow. A competition among elementary and high school students, the choreograph street dancing was an attraction by itself. Students in their colorful costumes dressed like a cow brings delight to the audience. June 24 | A celebration that coincides with the Feast of St. John the Baptist. Lechons coming from the barangays of the town are paraded at the town plaza. After the parade, the town’s people and guests partake in the fete. June 24 | This is a fiesta in honor of the town''s patron saint - Saint John the Baptist which is characterized by vigorous and boisterous streetdancing with "Basaan (dousing of water) and "Santong Tao" (live saints) parade. Includes also numerous free concert s featuring various local artists and celebrities. June 24 | A religious event where town folks wear vines, banana leaves or dried coconut leaves on their mud-covered bodies as St. John the Baptist was said to have done in his lifetime. June 24 | To convene collaborative partners in a Tourism Congress to tackle priorities in implementing a 5-year master plan crafted by the Core Tourism Group using the McKinsey Framework. The forum aims to address the challenge: Catalyzing Tourism Growth through Multi-sectoral Initiatives and Coordinated Leadership. June 24 | Description The townsfolk of Pila celebrate the feast of San Antonio de Padua through a procession, merry making and festive dining in most of the beautiful ancestral homes. The San Antonio de Padua Parish Church and the town plaza are the focal points of the activities. June 24 | Dressed in creative costumes and disguises, lechins are paraded around the town accompanied by gay chanting and buhusan a customary practice during the San Juan Bautista Feast. June 24-26 | A cultural festival showcasing the diferent cultures, traditions as well as the native and modern products of the various indigenous communities of Tabuk City. It is also a festival of Indigenous songs, dances and rhythms. June 25 | Activities are street dancing and ritual dance competition. June 25 | Search for the festival queen, with the lead female dancer of the competing festivals as the candidate. June 27 | A common Manobo ritual used for opening a kaingin, rice planting, harvesting and other activities. June 27 | Founding anniversary and thanksgiving for the bountiful harvest of cocoa, and the celebration of the replication of caves and cabyaw. June 27 | Pintados showcases the ancient practice of body painting (tattooeing) and how Tacloban’s ascendants came to accept Christianity and develop a great love for the Senior Santo Niño. 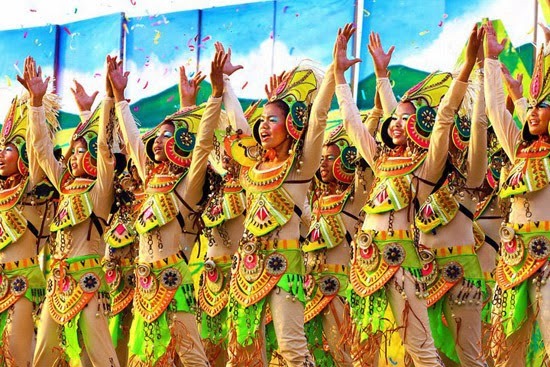 June 27 | A pageantry of colorful and diverse festivals of the municipalities of Leyte depicting their unique culture, history and way of living. June 27 | Activities are parade and cultural shows. June 27 | Activities are Agro Fair, street dancing competition and cultural parade. June 28 | Participants, mostly fishermen, exhibit their mastery and skills in maneuvering their attractive and colorful subiran craft, sailing and steering them in an 8 nautical miles race, along Cancabato Bay. June 28 | “Kaniyogan” or coconut plantation abound in this town and has become an important means of sustenance for its people. The festival aims to promote the diverse products derived from the “tree of life”. The celebration also features trade fairs, cultural and contemporary shows, sports activities and a beauty pageant. June 28- June 29 | A fiesta celebration in honor of Saints Peter and Paul highlighted by ethnic mardigras contests, agro-industrial fair and public dancing. June 28-30 | The most awaited activitiy of this festival procession where the image of St. Peter is brought down from Capalangan to Calumpit River where a colorfully decorated mini pagoda awaits the image. June 28 - July 05 | Celebrates the legendary Lake Lanao. June 29 | Performed during the Feast of Saints Peter and Paul by daughters of past participants with impeccable reputations as homage to the Virgen dela Rosa” for her kindness. June 29 | The festival is being held to honor the town’s patron saints Peter and Paul, a way of thanksgiving for the blessings from the sea. The celebration starts in the early hours of the morning, with a flotilla of intricately decorated boats that encircles Bulalacao Bay and met by the townsfolk at it lands on the shore. Marching continues on the streets with icons of the two saints greeted in religious manners by the devotees. A procession is done later at twilight and ends at the church ground. The traditional putong (crowning) of the patrons complete the final rituals amidst songs and dances by adults and children alike. A street dancing is also staged during the day participated mostly by students in indigenous costumes. June 30 | A spring festival where the legends of the place is express through street dancing and tableau competition.